For other uses, see Budai (disambiguation). "Hotei" redirects here. For the Japanese musician, see Tomoyasu Hotei. "Putai" redirects here. For the former city of China, see Binzhou. For its former county, see Boxing County. Budai or Pu-Tai (Chinese and Japanese: 布袋; pinyin: Bùdài; rōmaji: Hotei; Vietnamese: Bố Đại) is a Chinese folkloric deity. His name means "Cloth Sack", and comes from the bag that he is conventionally depicted as carrying. He is usually identified with or seen as an incarnation of Maitreya, the future Buddha, so much so that the Budai image is one of the main forms in which Maitreya is depicted in China. He is almost always shown smiling or laughing, hence his nickname in Chinese, the Laughing Buddha (Chinese: 笑佛; pinyin: Xiào Fó). In the West, the image of Budai is often mistaken for Gautama Buddha, and is hence called the Fat Buddha (Chinese: 胖佛; pinyin: Pàng Fó). Budai is traditionally depicted as a fat, bald man wearing a robe and wearing or otherwise carrying prayer beads. He carries his few possessions in a cloth sack, being poor but content. He is often depicted entertaining or being followed by adoring children. His figure appears throughout Chinese culture as a representation of contentment. According to Chinese history, Budai was an eccentric Chan monk (Chinese: 禅; pinyin: chán) who lived in China during the Later Liang (907–923). He was a native of Zhejiang and his Buddhist name was Qieci (Chinese: 契此; pinyin: qiècǐ; literally: "Promise this"). He was considered a man of good and loving character. In Japan, Hotei persists in folklore as one of the Seven Lucky Gods (Shichi Fukujin). 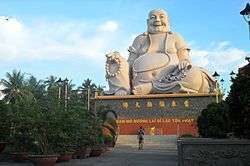 Statues of Budai form a central part of Yiguandao shrines, where he is usually referred to by the Sanskrit name Maitreya. According to Yiguandao, he represents many teachings, including contentment, generosity, wisdom and open kindheartedness. He is predicted to succeed Gautama Buddha as the next Buddha, and helps people realize the essence within, which connects with all beings. The primary story that concerns Budai in Chan Buddhism, Korean Seon and Zen is a short kōan. In it, Budai is said to travel giving candy to poor children, only asking a penny from monks or lay practitioners he meets. One day a monk walks up to him and asks, "What is the meaning of Chan?" Budai drops his bag. "How does one realize Chan?" Budai then takes up his bag and continues on his way. Many versions of the Ten Bulls feature Hotei in the tenth picture. 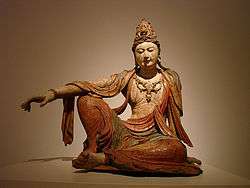 Angida was one of the original Eighteen Arhats. According to legend, Angida was a talented Indian snake catcher whose aim was to catch venomous snakes to prevent them from biting passers-by. Angida would also remove the snake's venomous fangs and release them. Due to his kindness, he was able to attain bodhi. In Chinese art, Angida is sometimes portrayed as Budai, being rotund, laughing, and carrying a bag. In Thailand, Budai is sometimes confused with another similar monk widely respected in Thailand, Phra Sangkajai or Sangkachai (Thai: พระสังกัจจายน์). Phra Sangkajai (Thai: มหากัจจายนเถระ), a Thai rendering of Kaccayana, was an arhat during the time of the Buddha. Buddha praised Phra Sangkachai for his excellence in explaining sophisticated dharma (or dhamma) in an easily and correctly understandable manner. Phra Sangkajai (Maha Kaccana) also composed the Madhupinadika Sutra (Madhupindika Sutta MN 18). Phra Sangkajai wears the robes in Theravada fashion, with the robes folded across one shoulder, leaving the other uncovered. Budai wears the robes in Chinese style, covering both arms but leaving the front part of the upper body uncovered. Benihana's famous figural "tiki mugs" for exotic cocktails, the most common of which depicts Hotei, have become collectible. Hotei statue at Jōchi-ji, Yamanouchi, Kamakura, Japan. The famous Benihana "Hotei" tiki mug, used for various exotic cocktails, has become collectible. 1 2 3 4 Cook, Francis Dojun. How To Raise an Ox. Wisdom Publications. pp. 166 note 76. ISBN 9780861713172. 1 2 "The Laughing Buddha". About.com. Retrieved April 20, 2013. 1 2 3 4 5 6 7 Leighton, Taigen Dan (1998). Bodhisattva Archetypes: Classic Buddhist Guides to Awakening and Their Modern Expression. New York: Penguin Arkana. pp. 260–261. ISBN 0140195564. OCLC 37211178. 1 2 3 4 5 "The Laughing Buddha". Religionfacts.com. Retrieved 2011-12-26. ↑ Peterson, Christopher (July 17, 2012). "When Did the Buddha Become Fat?". Psychology Today. Retrieved December 5, 2014. 1 2 3 "Hotei". Uwec.edu. 2008-11-16. Retrieved 2011-12-26. 1 2 Seo, Audrey Yoshiko; Addiss, Stephen (2010). The Sound of One Hand: Paintings and Calligraphy by Zen Master Hakuin. Shambhala Publications. p. 205. ISBN 9781590305782. ↑ "Hotei, Pu-Tai, Maitreya, all known as the Laughing Buddha". Newsfinder.org. 2002-06-16. Retrieved 2011-12-26. 1 2 "Tao Living: Maitreya Buddha". Taoism.net. Retrieved 2011-12-26. 1 2 Hart, Addison Hodges (2014). The Ox-Herder and the Good Shepherd. Wm. B. Eerdmans Publishing. ISBN 9781467438988. ↑ Senzaki, Nyogen (1998). Zen Flesh Zen Bones: A Collection of Zen and Pre-Zen Writings. Tuttle Publishing. ISBN 978-0804831864.